Tedious paperwork and stringent regulations are characteristic of payroll management at most organizations, making it a time-consuming and painful process. It not only requires keeping track of various tax provisions and deductions but also managing year–end documents based on local laws. Reason enough for companies to look for smarter ways to manage and ease their payroll life cycle. Enters Inspirria PayEdge for NetSuite is a SuiteApp that helps NetSuite users automate payroll process across the lifecycle. Completely built on NetSuite, it not only helps minimize paperwork and reduce costs but also fast-tracks payroll processes and enhances accuracy. Lack of visibility into payroll data hampers payroll performance. With Inspirria PayEdge for Netsuite, companies are better placed to gain end-to-end visibility into payroll data across locations and subsidiaries, resulting in enhanced ability to track budgets and ensure complete control over payroll data. Accurate financial analysis is crucial for ensuring compliance and enabling timely payroll management. PayEdge leverages the information in journal entries for accurate reporting and enhanced financial analysis. This helps businesses accurately calculate increments, arrears, variable payments and deductions, as well as LOP and adjustments. The result: timely disbursement of salaries, enhanced compliance, and improved employee productivity. Effective payroll is far more difficult without logical grouping of employees. Inspirria’s PayEdge for NetSuite solution helps you logically classify employees into different groups and define salary components for each pay group. In addition, it helps manage location-wise pay roll scenarios that are specific to your organization. 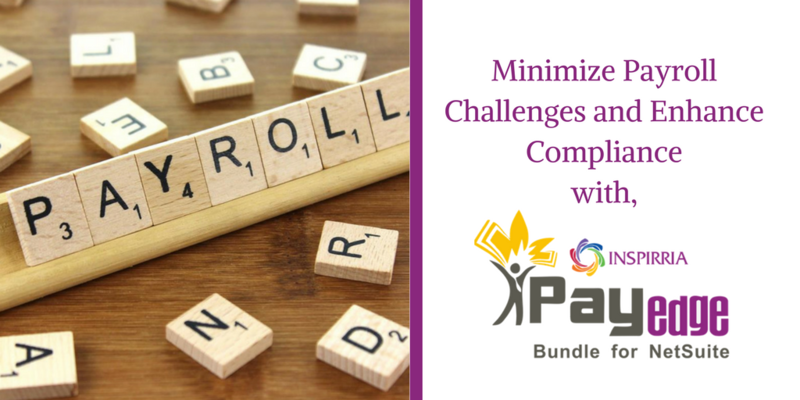 Successful payroll management is critical to ensuring an organization’s payroll function operates smoothly, without any hiccups. Leveraging a payroll app such as Inspirria PayEdge for Netsuite improves an organization’s ability to quickly and efficiently handle high volume, complex payroll batches. Features such as single click payroll processing, salary hold arrangement and multi-currency support, help meet targeted goals and timelines. The result: simplified and effective payroll management that let’s your staff focus on high value tasks aligned with key business priorities. Inspirria is a leading Netsuite partner since 2004. We leverage our cutting-edge expertise to customize our SuiteApp - PayEdge for Netsuite - based on your business needs, helping you enhance payroll management processes and improve efficiency and compliance.